When I was in Lewa in April, the ranger team – whom I have known for a few years – helped locate the iconic female black rhino Waiwai – who was out and about and reputedly has the longest horn of any rhino left in the world. It took time and the drive to her was a little gruelling but ultimately it was an encounter that I will always remember – what a spectacular prehistoric looking animal – quite remarkable. Over the next 48 hours, I twice came as close to her as I dared on foot – she is a fierce mum and most protective of her young calf. When I shared the image on our social media channels, the reaction was bigger than ever before – over 10,000 responses! Most commented on her extraordinarily long horn – it does look like a facial appendage from “Game of Thrones”. But a couple of people suggested that I was being an inadvertent friend to the poachers in giving out the location of this iconic rhino. That is a little naive and ill-informed. The Lewa conservancy employs 160 armed and highly trained rangers in its 62,000 acreage and there has been no poaching for five years. These two statistics are joined at the hip. 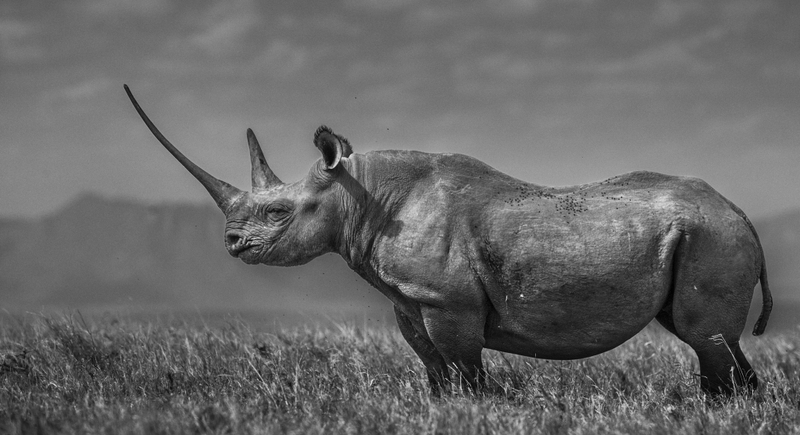 Posting a rhino image from Lewa is rather like posting an image of a number 91 red bus in London. They are plentiful, they move around and they are safe. Lewa are proud of the number of rhino that now roam the downs and rightly publicise their success. Conservationists need to tell good stories and myself and others need to take pictures of those stories. If there was no good news, why would good money follow bad? I do think that we need to encourage the fraternity of desk-bound animal activists on social media to be more positive, more “glass half full” and less jumpy.